Mechanic Mike Hadaway and Homer Jones wait with us for our van part to arrive. Van trouble struck on a recent trip to Georgia. Husband Walter and I were scheduled to stay with grandchildren while their mom was involved in a series of all-day classes. Fortunately we had started out a day early with plans to spend a night at the mountaintop lodge of an Alabama state park. But before we began the ascent to the park, something went wrong. The van’s check-engine light came on, the vehicle started running rough and it was losing power. We turned off at New Site, the first little town we came to. We asked about any auto repair shops in the vicinity. There was only one in the community of fewer than 1,000 people. We pulled up to S & S Discount Tire at 5:02 p.m. Mike Hadaway, the young mechanic/operator of the tire store and repair shop was closing up. He was obviously ready to go home to wife, kids and downtime. But he never faltered in his courteous, helpful, friendly attitude. He immediately went about the business of hooking up the apparatus for the electronic sleuthing that is evidently the norm for automotive repair these days. Hubby pulled out our sturdy and comfortable camping chairs, positioned them in the shade in front of the repair shop, and helped me settle safely for our wait. Homer Jones, a neighbor of the shop from “back up the hill,” had parked his golf cart near us. He and I swapped chronicles of our strokes, his from 1985 and mine from 2011. My descent from our van, the way I walk and a curled up left hand leave no doubt about my status as a stroke survivor. It comes with my survivor status that strangers who are fellow stroke survivors or family and friends of survivors are likely to strike up conversations. That is actually a rewarding side effect of stroke survival. Their stories are always interesting to me, and I usually find encouragement and useful tips through our conversations. And when they keep asking questions, I think maybe my experiences offer something to them, too. Before long Mike came out from under the van’s hood, carrying a black object. It didn’t look impressive to me, but it was crucial--the distributor cap. It had cracked. The result was two injectors cross firing or working at cross purposes or some such thing. The precise automotive term escapes me now. Anyway, we needed a new distributor cap, and Mike didn’t have the part in stock. While he started calling to locate the correct part, Homer offered, if it turned out that the appropriate part was not immediately available, to go back home for his car and ferry us to one of the two available motels in the larger community nearby. Since it was already after hours, that offer was appreciated, but I hoped we wouldn’t have to take him up on it. When Mike returned, he reported that his boss, owner of the shop and two other shops in the region, should arrive in an hour, maybe a little less. The sun was easing toward the horizon, and a cool breeze had arrived. 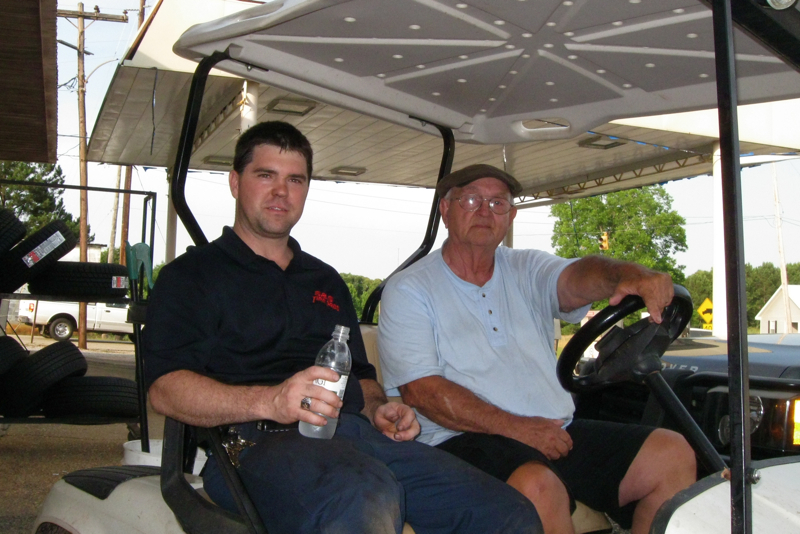 Mike settled into the golf cart, and “bonding” continued. In the south there is always the potential for bonding. My experience has been that the potential in a small rural community ramps up to a certainty unless the newbies are absolutely anti-social. Hubby, Mike and Homer were soon deep into conversation that ranged from family and work experiences to local natural attractions and topics in between. When they explored their musical preferences, Mike pulled out his smart phone, made a few quick taps. One of our favorite 70s oldies, Dancing Queen by ABBA, poured out of a repair bay. That was magical to me, but smartphones and bluetooth technology are ordinary conveniences for the young mechanic, his generation and elders less technologically challenged than Hubby and I are. The shop owner arrived. Within minutes Mike had the distributor cap installed and our van running smoothly again. Our unintended and unexpected intergenerational gathering was at an end. But those Alabama good Samaritans had banished the threat of a sunshiny, blue-sky day turning dismal. i think this might just be my most favorite of all your stroke related stories... God bless those men for helping you and what a blessing to find them just where you needed them. What good people they are! Awesome story. How fortunate you found such special, delightful people. I wonder if it had happened in a big town what the result would have been? I do love small town people. They see past the dollar to the person. I'm so sorry you and Walter had car trouble, but hearing your story helps restore my faith in mankind! How fortunate you were to run into--not one, but two--good Samaritans.